For researchers, students, lecturers and practitioners. Suitable for Diploma, Masters and Undergraduate level counselling students, students of psychology and positive psychology and practitioners of humanistic counselling and psychotherapy. 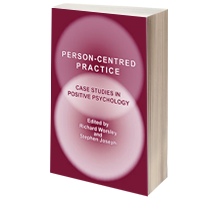 Follow-up volume to the best-selling, critically acclaimed Person-Centred Psychopathology, Person-Centred Practice: Case Studies in Positive Psychology takes forward the work of the previous volume by rooting the theory of that volume in the practice of internationally renowned practitioners and scholars. The book demonstrates that person-centred theory has real depth in its ability to address the distress of challenging client groups.Case studies show how mature practitioners engage with a range of issues in psychopathology: eating disorders, post-natal and maternal distress, childhood sexual abuse, long-term depression and its existential components, issues of spirituality, psychotic functioning and loss of psychological contact. There is a focus on the first-person voice of three clients and reflections on training by a clinical psychologist. Two case studies look at the political and social aspects of therapy. There is an analysis of a previously unpublished interview with Gina by Carl Rogers, a paper on models for understanding hallucinations, and a chapter on assessment instruments which are congruent with person-centred practice. This book builds bridges between counselling theory and practice, as well as between person-centred therapy and the new and important discipline of positive psychology.